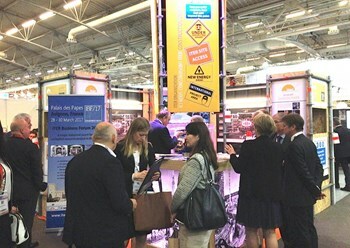 Scaffolding and plywood are not the first-choice materials for an exhibition booth, but the ''construction design'' of the ITER stand certainly managed to attract the curious. The international nuclear industry last week convened in Le Bourget, just outside Paris, for the World Nuclear Exhibition (WNE). Hundreds of exhibitors and many thousands of visitors participated in this second edition of the event—and this time the fusion community participated too, holding up the ITER flag. With a new and extravagant design, signaling that the project is "under construction," the ITER booth attracted a lot of attention. During the opening ceremony, Fatih Birol, executive director of the International Energy Agency (IEA), noted that the event was being held in the same location as last December's historic COP21, at which 180 nations reached an agreement on addressing climate change. "Nuclear for climate" stickers spoke to the nuclear industry's potential to combat climate change. However the challenges remain, as the event's president, Gérard Kottmann (also president of the French Nuclear Industry Exporters' Association, AIFEN) pointed out, asking "How can we make nuclear power "safer, cheaper, quicker, and more sustainable?" An additional challenge is political, he stressed, noting that Europe doesn't recognize nuclear power as "clean." 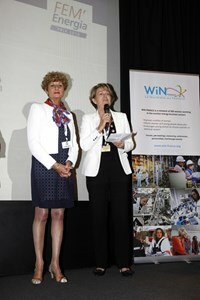 In recognition of her outstanding career in the nuclear field Francoise Flament (right) received this year's Women in Nuclear (WIN) Award from Dominique Mouillot, president of the gender equality initiative. 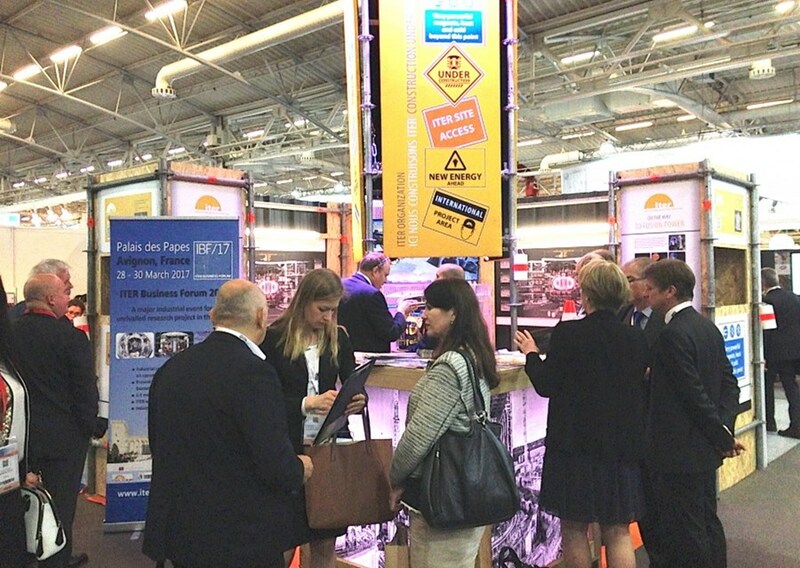 "Clean" is one of the advantages of fusion energy, as the visitors to the ITER stand soon learned. Their attention was also drawn by a new feature, a virtual 3D tour of the ITER construction site—a spectacular experience that not many passers-by refused. Big conferences also tend to add some limelight to the daily routine of business by recognizing outstanding people or unparalleled technical achievements. In a special ceremony on Tuesday 28 June, ITER Director-General Bernard Bigot handed out the prize for "innovation," one of four award categories (with nuclear safety, operational excellence and knowledge management). Two days later, it was the turn of one of ITER's own to receive a prestigious award: Francoise Flament, head of the Procurement & Contract Division, received the WIN (Women in Energy) France 2016 prize for her outstanding career in the nuclear field.